Camp is 3.5 miles From Route 206 (When you turn onto Struble Road). Some GPS units will not take you directly to the entrance. It may stop you at the sharp left before camp. Continue to follow the paved road until you see the sign at the entrance. Take the exit from PA Route 84 for Milford, PA and proceed into Milford. Continue straight at the intersection onto Route 209 and Route 206 South. A few miles outside of Milford, Route 209 and 206 will separate. Proceed left on 206 into New Jersey across the Milford Bridge. Approximately 10 miles from PA you will pass an RV dealership and Italian restaurant on your right. You will continue on 206 North up a hill past a sign for Dingman's Ferry. Once past this sign, get into the right hand lane as you go up the hill. 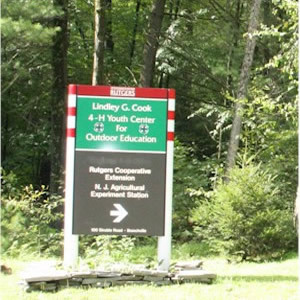 You will see a small sign for the "Lindley G. Cook Youth Camp" on the right side of the road. Struble Road is the right hand turn just after the sign. Take Route 80 west to the Sparta exit 34B for route 15 North. Follow 15 North through Lafayette until it intersects and becomes Route 206 North at Ross' Corner (Exxon Gas Station on your left). Continue straight onto 206 North for approximately seven miles. You will pass the main entrance to Stokes State Forest on your right. As you come down the hill, you will see a small brown sign for the 4-H Camp on your right. Take the next left onto Struble Road. (If you go past Fratelli's Restaurant on the left, you have gone too far.) Be careful of traffic when you make this turn. Take Route 80 East to exit 25, which is Route 206 north. Follow 206 North through Newton and bear left at Ross' Corner. Continue straight onto 206 North for approximately seven miles. You will pass the main entrance to Stokes State Forest on your right. Take Route 287 North to Route 80 West. Take Route 80 west to the Sparta exit 34B for Route 15 North. Follow 15 North through Lafayette until it intersects and becomes route 206 North at Ross' Corner. Continue straight onto 206 North for approximately seven miles. You will pass the main entrance to Stokes State Forest on your right. As you come down the hill, you will see a small brown sign for the 4-H Camp on your right. Take the next left onto Struble Road. (If you go past an RV dealership on the left, you have gone too far.) Be careful of traffic when you make this turn. Coming from the South (Route 206) Take Route 206 North to Newton NJ. Continue through Newton on 206 north until it intersects Route 15 at Ross' Corner. Turn left onto 206 North for approximately seven miles. You will pass the main entrance to Stokes State Forest on your right.